Our classic version of pawn shop management software. Proven reliable in over 12 years of daily use in pawn shops across the country. The independent pawn shop owner has unique business software needs and before now their choices to fill those business needs with pawn shop software were limited to products designed for the larger chain stores. Those other pawn software products usually included many features the typical pawn shop didn't need but had to pay for anyway. We built Pawn Wizard software from the ground up for Microsoft Windows® operating systems and are time tested and proven in pawn shops across the country since 2002. 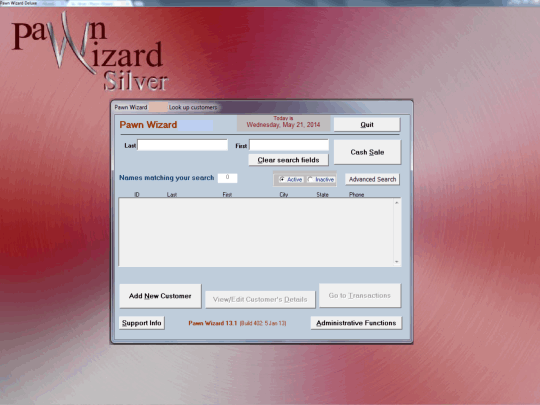 Pawn Wizard Silver is the culmination of years of development and is compatible with Microsoft Windows® XP, Vista & Win7 32 or 64 bit operating systems. Click Here to Get Your FREE Copy of Pawn Wizard Silver Today ! We ran into some hardware issues and contacted Wizard Software support. The assistance provided by Wizard Software’s support was spectacular, even though the problems we encountered were not caused by the program. The small amount charged for annual support was worth every penny that I paid for it, in this issue alone! Wizard Software has been our gold buying software of choice since 2009! The program is very simple & intuitive to use. We have used the program 3 years and have put it in all 3 of our stores. We would highly recommend the program to anyone that needs a cost effective, easy to understand program. Before Wizard Software, the day end procedure took almost half an hour. Now I can have my Cash Drawer balanced in a matter of minutes. Closing procedure has gone from nearly 30 minutes to no more than five minutes. Pawn Wizard's software works very well for us and the cost is affordable. Their staff is very helpful. I recently had a armed robbery in my store. They wiped me out and even stole my computers. luckily I still had the back-up from the store and had all my customers info. I was in a panic because I did not know how to install the back up to my computer at home, But as soon as I called Pawn Wizard support it was amazing! They helped install a new Pawn Wizard software on my home computer and reinstall everything from memory stick back up! You don't know how scared I was to loose all my store information. But thank God for Pawn Wizard's support they walked me through every step of the way! Since my store is now In operable, I am able to use the vital information tat Pawn Wizard helped me install so I can pretty much run my store from home. Pawn Wizard's staff is great and (WOW) very patient and helpful. I started playing with your system today and I'm impressed by how easy its to use. Technicians were extremely courteous. They were very helpful during all phases of installation. Allison was courteous, knowledgeable and delivered excellent service to the highest degree. Best software support experience I have ever had, and I have had many opportunities to deal with software companies. You have always been there, always helpful and done exactly what you said you would. Thanks! Brian is outstanding. He makes us feels like someone understands our side, we are upgrading to the new PRO product all because of Brian. Pawn Wizard Pro is very intuitive and fun to work with. I love the simplicity and functionality it delivers. Sales and Support were great. They walked me through every step in the process and now I'm opening my second store with them. Click on the Tabs on the Left below to reveal all the Features and Benefits our Pawn Wizard Silver will bring to your pawn shop. Create Sales ticket for one or multiple items. Reverse Tax feature too! …. And even more Reports to keep you on top of your business! Uses integrated Laser e-Forms. No more big boxes of forms to store. A Pawn Wizard exclusive!